May 19, 2015 May 23, 2018 ~ Steve N.
Everyone has a different idea of what’s good. And that’s a problem. Finding places that I think are good takes time and lots of research, and then there’s still a chance I’ll manage to pick a dud or two. But I think I did pretty well. In total I ate at about 10 different restaurants while in Chicago. Here’s four that stood out as extra special to me. Chicago has a vibrant taco scene, and if you’re looking for tacos, there are dozens of joints that make good ones. Big Star is on a couple of “Best Tacos in America” lists, so it was a no brainer to eat there. I arrived on a Sunday, at 3pm. I figured it would be slow then. Boy was I wrong. The joint was mobbed. Big Star is in a hip neighborhood and the hipsters were out in force. Luckily, I managed to score the only open bar seat. I ordered tacos de panza (pork belly, left) and the al pastor. They were fantastic. 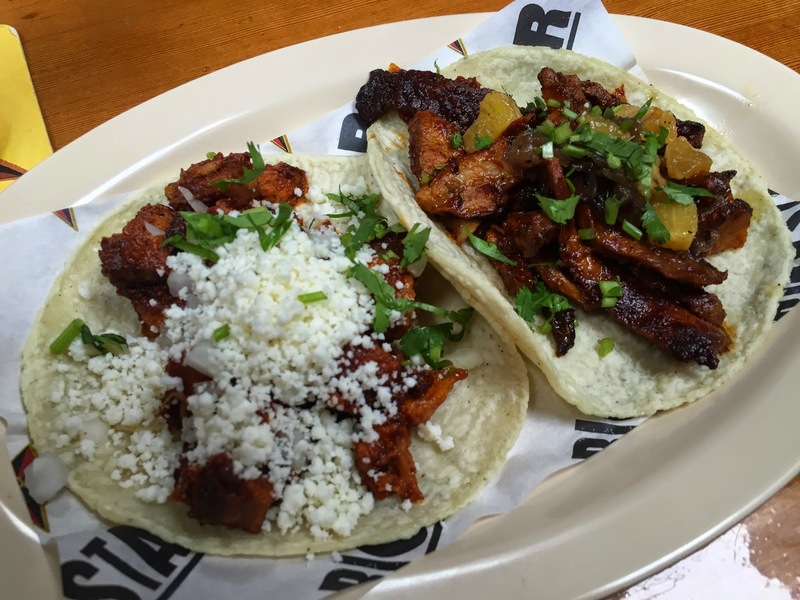 Just look at the char on that al pastor. Only 3 bucks each to boot. I really, really, wanted to get a couple more tacos, but just two doors down from Big Star is Dove’s Luncheonette. And after taking one look at the chicken fried chicken, proudly displayed on their home page, I knew I had to eat that thing. Dove’s is a small, funky diner, with southwest inspired dishes. The interior is very cool, with a hip 70’s vibe, wood paneling included. Thankfully, there were no crowds at Dove’s, and I settled in at the counter and ordered the chicken fried chicken. WOW. This had to be the best dish I ate all week. I’d move to Chicago, just so I could eat that once a month. A large boneless breast, that was tender and super crunchy. 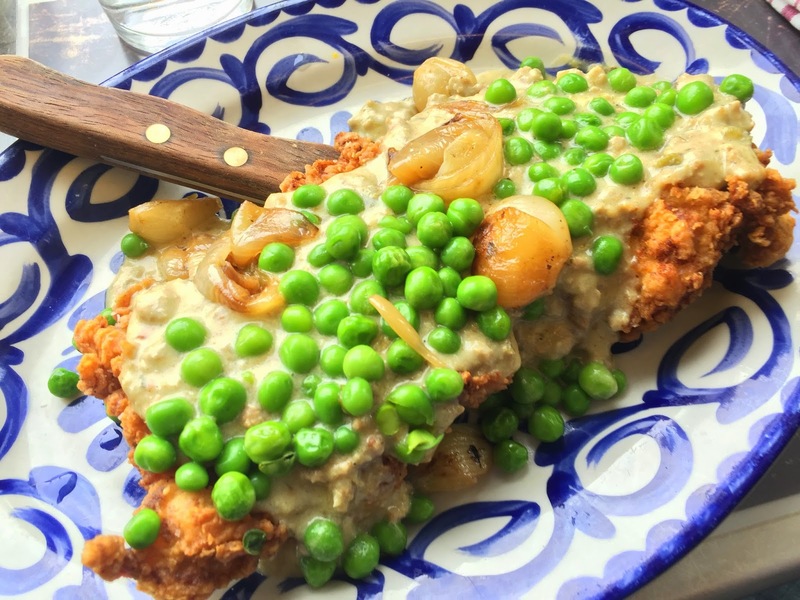 With peas, pearl onions, and “salsa verde” gravy. The gravy makes the dish, with its complex flavors and subtle heat. This dish is comfort food genius. It is the very definition of comfort food. I will not soon forget it. Au Cheval is another kicked up, funky take on a diner. They’re famous for their burgers. (And I’m a sucker for a good burger). Au Cheval makes burgers in the style I love most. Thin patties, well crusted from contact with a searing hot flat top, cooked in their own fat, a la Five Guys. Oh this was going to be good. I dragged 3 other guys with me, and I think they were skeptical. But it was all expressions of gratitude and thank you’s after they dug into those burgers. All 4 of us ordered—at the recommendation of the waitress—our burgers with egg and bacon. Thick cut heavily peppered bacon, and a perfectly cooked sunny side up egg. We waited over an hour for a table. But it was worth it. The burgers are world class good. They put their homemade mayo on it, and it is one of those little touches that elevates and already fantastic burger to heavenly heights. 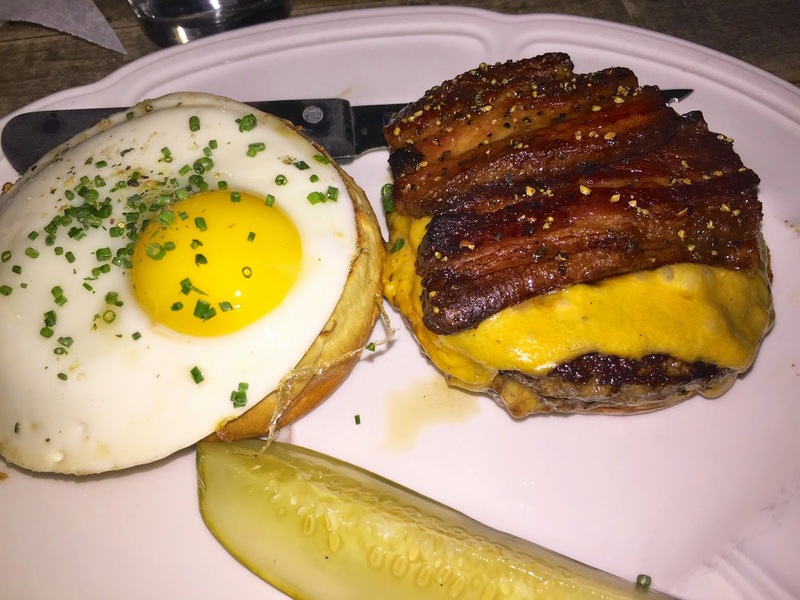 It’s worth a trip to Chicago, if just to go to Au Cheval. Two of my companions said it was the best burger they had ever had. The fries too are worthy of mention. Hand cut in house, they arrived to the table piping hot. So hot we could barely eat them. And crispy, ooh, they were crispy, and perfectly salted. Lastly, I want to mention Little Goat Diner. This one was completely off my radar, and in my research I hadn’t discovered it. But my wife suggested I go here after she saw that Gwyneth Paltrow had blogged about it on her site. Again, it’s a diner that’s taking diner food to the next level, and the menu looked intriguing, so I decided to go for breakfast. I ordered a funky asian inspired egg biscuit sandwich that came with blackberry sauce. It was good, I enjoyed it, but the star of the show had to be the hash browns. Fate was shining down on me that morning. I had only ordered the sandwich, and a coffee. But as I was sitting at the counter, waiting for my food, I saw a server bring the hash browns to another table and my mouth dropped open. I then watched as the server returned them to the kitchen. Apparently, it was a mistake and the table hadn’t ordered them. I quickly flagged down my waitress and asked if I could have the orphaned potatoes. She was happy to oblige. 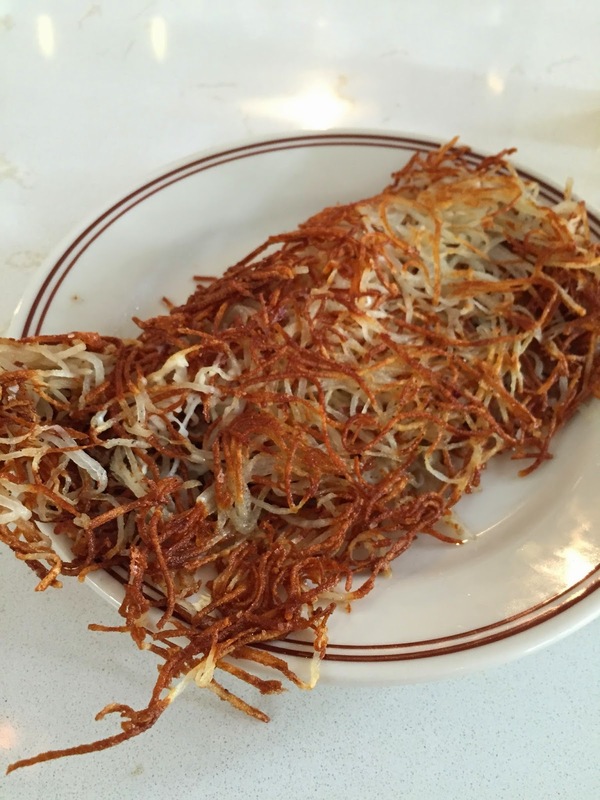 This was one of the best takes on hash browns I’ve ever had. They’re simple. Just potatoes and salt, nothing fancy going on here. But they are shredded very thinly and they are fall to your knees and thank God you’re alive crispy. Potato heaven. Loving this. The pictures here are so important too. That egg is totally perfect. And those has browns look amazing. Well done.